Available in April from Amazon or by order form - see below. between artistic practice, programming and theories of artificial life and emergence. with consultancy from Professor Igor Aleksander of Imperial College London. The research culminated in an art installation exhibited in Manchester, London and New Orleans. The BIOTICA installation was conceived as an artwork questioning what is it for something to be understood as 'alive'? More than just a scientific demonstration, BIOTICA amalgamates neural net technology, the simulation of three dimensional physical space and gestural interaction with artistic practice to produce a visceral, immersive experience of artificial life. This book investigates the many ideas and issues informing the project, acknowledging the achievements and problems in seeking to develop an artwork that would harness the properties of emergence. 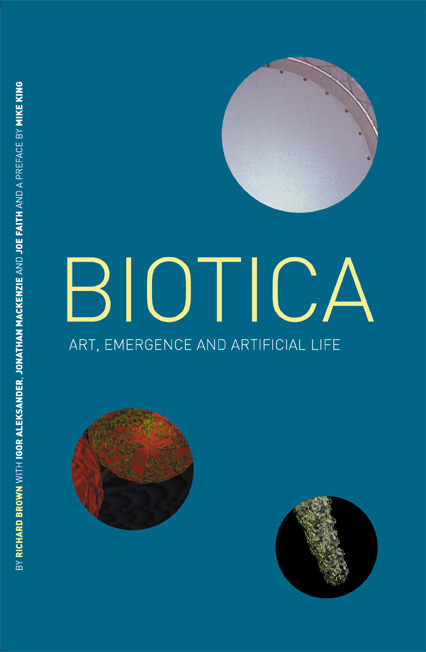 The preface by Mike King and essays by Igor Aleksander, Jonathan Mackenzie and Joe Faith provide a critical contextualisation of BIOTICA in relation to scientific research and other art projects in this field. Interval Research Corporation. A major award from Intel Corporation towards the development of real time interactive artworks and funding towards programming support from the Arts Council of England enabled the completion of the BIOTICA project. territory in the Computer Related Design Research Studio. His work has recently been recognised by a Fellowship award from the National Endowment for Science, Technology and the Arts (NESTA).